"Funny, charming and absolutely nuts." What about that piano? Having seen Thor: Ragnarok earlier this week, we're delighted to say that it's the funniest film in the Marvel Cinematic Universe since the original Guardians of the Galaxy was released. Aside from the superb action and breathtaking set-pieces, it's the gags that stay with you and that's down to two people. 1) Taika Waititi - The superb director of the brilliant Hunt for the Wilderpeople, What We do in the Shadows and Flight of the Conchords. 2) Jeff Goldblum - In a remarkable career that has seen him play some very quirky, off-beat and unusual characters, his performance as the Grandmaster is probably his most 'Goldblum-y' role yet. We won't ruin the film for you, but he's worth the admission fee alone. As is the norm with all major films, the actor made an appearance on the Graham Norton Show to promote Thor: Ragnarok and he didn't disappoint. We already know that Jeff Goldblum is a darling of the Internet - who doesn't love those memes or the Facebook page The Same Photo of Jeff Goldblum Every Day? - but the star of Jurassic Park and The Grand Budapest Hotel was in flying form when he sat down on the couch next to Jack Whitehall and Gerard Butler. Of course, very few people could get over his age or that sparkling polo neck. It takes one cool man to pull off a polo neck. To his immense credit, when he's not talking about his new film, Goldblum was more than happy to discuss the trappings of getting older and the hair removal process that comes with it. Jeff Goldblum currently offering the most charming description of ear hair removal on Graham Norton. Ah yes, those piano skills and the lozenges. Jeff Goldblum handing out Lozenges on #GrahamNorton made me laugh. Guy is comic gold! People also loved his bromance with Gregory Porter. Everyone on #GrahamNorton is talking about Hillary Clinton, like they didn't just literally see Jeff Goldblum play jazz piano 4 Greg Porter. After watching #GrahamNorton tonight, I think it's pretty obvious that the US made a huge mistake. #JeffGoldblum should be President. 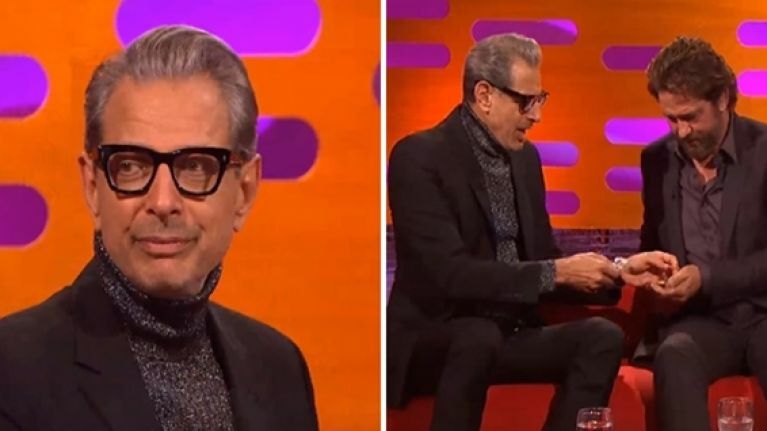 Loved #JeffGoldblum on the graham norton show. Funny , charming and absolutely nuts. This story about his wife - who just happens to be a contortionist - just sums up the man.